Ink and Lace with Sheryl Cauble: Blog Candy Winners and a brand new FBD challenge! Blog Candy Winners and a brand new FBD challenge! Hello to all of my very talented and crafty friends! I appreciate all of you so very much! two year old grandson pick for me! This is such a fun stamp to color! This is my first time using her. say, that I had absolutely no idea what I was doing! Lets just say that I can use a lot more practice! I'm looking forward to it though! Coloring is fun and relaxing! Sheryl, in the comment section for a 10% discount! Then we hope that you can join in on the fun! THIS IS GORGEOUS!!! Sheryl, you do create with the most beautiful embellishments. I love the softness of the card and how you made it GLAM at the same time. Beautiful sunny card, thank you for joining us at Sweet Stampin' this week. Very fun, summery card. I love how you used that layout. Sheryl, this is wonderful. love all the detail and the image is awesome and colored beautifully. Hi Sheryl. Beautiful card. Sorry I didn't make it in for the candy. You said you didn't know what you were doing coloring it but it looks like a pro did it. Great job. Sheryl, Yay for me winning some blog candy (I just sent you an email) - thanks so much. This card is so fun and really reflects your tropical/hula/party theme. I like the way you colored the image and the flowers are wonderful. I want to get some Prismas and play with them too. Great birthday card and super image. Hugz! Great use of the sketch! Fun colors. 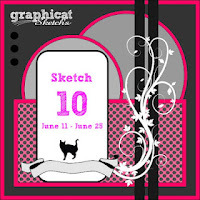 Glad you could join us at Graphicat Sketches this week. Such a fun tropical card Sheryl. You did a great job coloring with the pencils and markers. Fabulous embellies too. Enjoy your day. Your card is so pretty...wonderful embellishing! Lovely card Sheryl - I agree that colouring is so relaxing.. am currently practising with Distress inks! Ooo look at all those wonderful eye catching colors. This is precious Sheryl. :-) Thank you so much for all your wonderfully encouraging comments on my blog. Hugs! Wow Sheryl its just gorgeous. Love your colours and gorgeous elements. Makes me want to shake my hips lol. Thanks for the lovely write up on F&F. I will post my card in the morning with a link there. Have a lovely weekend. Such a cheerful looking card Sheryl! The hula girl is just great and I love how you have coloured her and incorporated all the different elements in matching colours. What a fun card, I really like the contrast between the hula girl and all the bling. So sweet and summery. Love the big gingham bow. Thanks so much for joining us at Sentimental Sundays this week. Super Cute!! Thank you so much for joining us at Love to Create Challenge this week!! Come back and play with us again really soon! Love the flowers you used on your card! Thanks for joining us at Love to Create Challenge! Hope to see you in our next challenge! Hi Sheryl -- Nice to meet another Bay State crafter! I've recently met a few and come to find out, we had even taken workshops together at AE (my LSS). Not sure which are you are from, but I'm up on the North Shore/Cape Ann and often visit "Absolutely Everything" in Topsfield to shop and take classes. It's the closest true scrap store to me and I totally enjoy it there! Thanks for visiting my blog...I'm now also following you and hope to see you around more in blog land! Cute card!!! Thanks for joining us at Love to Create Challenge!